Offering an incisive analysis of how hyper-individualism is poisoning the nation’s political atmosphere, E. J. Dionne Jr. argues that Americans can’t agree on who we are because we can’t agree on who we’ve been, or what it is, philosophically and spiritually, that makes us Americans. Dionne takes on the Tea Party’s distortions of American history and shows that the true American tradition points not to radical individualism, but to a balance between our love of individualism and our devotion to community. I enjoy learning about politics, and have read a number of books on the subject in the last few years. I find it especially interesting now, as the country is so divided on many issues—how did it come to this? How can this be resolved? Dionne’s book examines this topic and does so looking back at historical societal trends, the birth of socioeconomic philosophies, and our nation’s current events. While Dionne clearly leans towards liberalism (and says so), I appreciated his fair discussions of both conservatism and liberalism, democrats and republicans, and the many factions of both sides therein. America’s identity is balanced by two threads: individual freedom and community. Mostly what resonates is Dionne’s assertion in the “American Experiment” is that the individual cannot exist without community, and vice versa. Our history is important, and it’s important to have the facts straight. All factions of the political spectrum in the United States (radical individualism, compassionate conservatism, progressive liberalism, and so on) are guilty of selective history, taking only what facts serve their current ideology that it’s easy to forget how much balance is needed. It’s interesting, too, how much these political factions have changed over the years, in some cases even flipping ideals entirely. 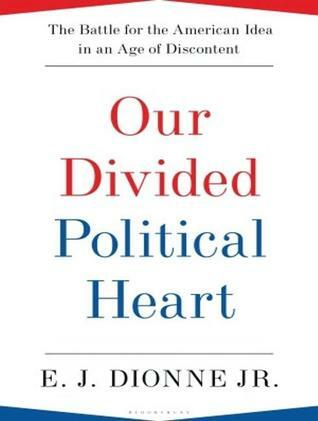 Our Divided Political Heart was a slow listen for me—I do best with audiobooks on a long road trip and wasn’t on one when I listened to this, so it was tough to find time for it in my normal routine. And it’s very dense, sometimes a little dry and “academic.” Nevertheless, it’s a thought-provoking, informative book and great for those interested in American history, current affairs, and politics. Listened to audiobook from June 23 to July 19, 2014. This entry was posted in books and tagged american history, audiobook, history, non-fiction, philosophy, politics, society by kristin @ my little heart melodies. Bookmark the permalink.